The Robin Hood Foundation has reaffirmed their support for Sandy recovery and the work of A Future With Hope by allocating a new grant to A Future With Hope and its partners. The new grant of $1.45 million grant from Robin Hood is set to be split among A Future With Hope, the Episcopal Diocese of New Jersey (EDNJ), SBP (formerly St. Bernard Project) and the Affordable Housing Alliance (AHA). This money is in addition to the $750,000 in grant monies the organization has previously granted to A Future With Hope and the United Methodist Church. Robin Hood is New York’s largest poverty-fighting organization, and since 1988 it has focused on finding, funding and creating programs and schools that generate meaningful results for the families of the region’s poorest neighborhoods. Following Superstorm Sandy in October of 2012, Robin Hood organized a relief fund to help meet the challenges left in the storm’s wake. Robin Hood has received more than $74.7 million in contributions which have been granted to hundreds of organizations in New York, New Jersey and Connecticut. Since its founding, the organization has raised more than $2.5 billion in dollars, goods and services to provide hundreds of the most effective soup kitchens, homeless shelters, schools, job-training programs and other vital services that give struggling citizens the tools they need to build better lives. Many of those communities are where A Future With Hope continues to rebuild and bring families home. With an estimated 4,000 families yet to complete their recovery in New Jersey, A Future With Hope’s steadfast commitment to seeing the recovery work through to completion has helped bring hundreds of families home over the last four years. In 2016, the organization rebuilt its 250th home. 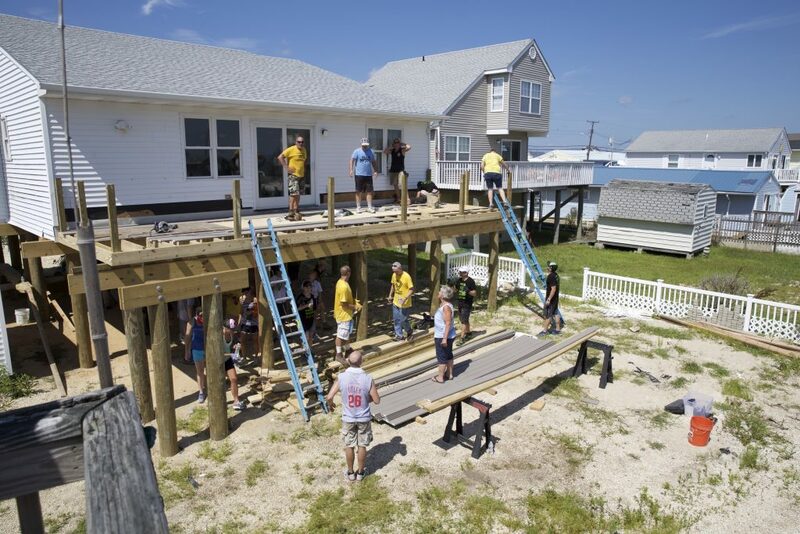 A Future With Hope worked with SBP, EDNJ and AHA on applying for a collaborative grant through Robin Hood to drive partnerships between the organizations and finish the job of getting Sandy survivors home. Through 2016, more than 11,000 volunteers have helped move families over that finish line by working with A Future With Hope. Volunteers are needed through 2017 as work continues. In addition to the grant, generous support from UMCOR and the GNJ Mission Fund has contributed in paving a way forward for A Future With Hope in 2017. The organization continues living into its role as the mission arm of GNJ. In addition to the Sandy recovery ministry A Future With Hope has begun training churches to engage in community development through Communities of Hope training. Over the next 15 years, a goal of launching 100 Hope Centers will move the mission arm toward sustainability beyond disaster relief and recovery and into community renewal throughout New Jersey.